We make custom Phone Cases very unique and special designs.Whether it is a design of your special person💑, family 👨👩👧, or even your dog 🐶. We make For iPhone and Samsung galaxy Phone models. The print quality is UV. 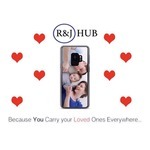 You will love your new mobile case! Ask me for a free mock up to see if the case is right for you. Get rid of your generic case and let your phone shine 📱. Please contact me if you are interested, I would love to help! Free shipping please allow 3-6 business days.